I don’t consider myself someone held back by fear. As a former lawyer who threw it all in to start a coffee chain with my brother, I know my career path personifies life outside the comfort zone. My first book is titled Anyone Can Do It and is all about overcoming the fear of starting a business. My motto is “leap and the net will appear”. I noticed how easy it was for me to listen to that voice and file the new risk and thus the new opportunity away. So I set about trying to deal with the fear, delving into it. That didn’t work. Instead of the fear disappearing, I found myself with a very busy mind, running a marathon of inner dialogue, grappling with the fear like a person wrestling a gorilla. You can imagine how well that went. Then a few days later, suddenly out of sheer frustration, I snapped out of it. I remembered my tried-and-tested method, which I used to employ routinely back when I started my first business, but which I had momentarily forgotten. The truth is we didn’t deal with the fear. Why? Because we were too busy. We never had time to sit staring into the sunset asking ourselves, did we make the right decision? Shall we continue or give up? And thank God we didn’t, because maybe if we had, we wouldn’t have persevered. Instead, we just focused day-to-day, working through the daily grind, one little goal at a time. So I realized I could apply the same principle to my scary new venture. 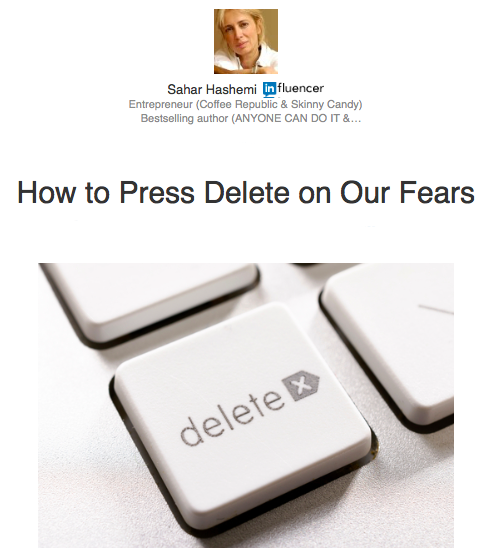 In order to press the delete button on the busy inner dialogue, I needed to start doing somethingtowards my idea – anything really. I had been too much in my mind, too much navel gazing and looking meaningfully in the distance contemplating my path. I needed to get momentum on my side. 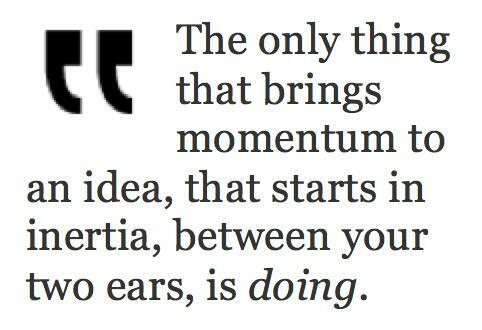 And the only thing that brings momentum to an idea (that starts in inertia, between your two ears) is DOING. So I started on a to-do list of a couple of stuff I could do to get my idea off the ground. I sent the first email, and then another. The next thing I knew I had some appointments in my diary. Surprisingly soon, there was a bit of momentum – and I was too busy to indulge in fear.